Founded in 1989 in the UK, Aura began with the VA40 integrated amplifier whose low-rider profile didn't exceed 55mm in height and whose chromed front sported but three controls. Eventually acquired by loudspeaker house Bowers & Wilkins, Aura became Japanese in 1996. Today the Aura brand is a collaborative venture between Aura Design Japan, April Music of South Korea and the British design house Pentagram around Kenneth Grange. The Korean-made Aura Neo & Groove with the Japanese roots have evolved by separating the original Aura Note CD/receiver into two enclosures and adding power and features. 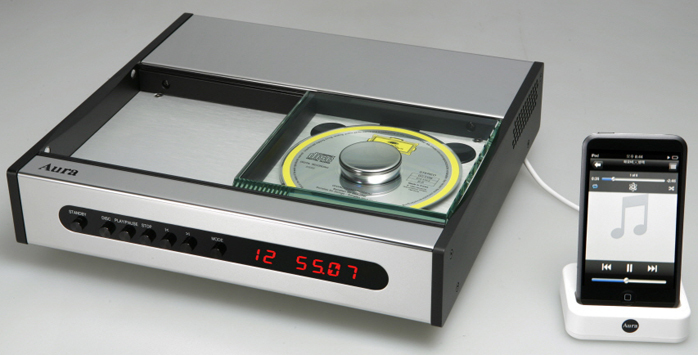 While the deep-chrome cosmetics and ¾ foot print of 286 x 300mm with height of 75mm derive from the all-in-one predecessor (now in 2nd-gen Premier iteration), features and specifications seem lifted straight from the book on April Music's Stello 500 components. The original credit card remote of the Aura Note doubled in length and split into two different layouts to accommodate the specific functions of either box. For the top-loading Neo, upscale ingredients include the AK4117 digital receiver from Asahi Kasei, the matching AK4125 96/192 sample-rate converter (with bypass function), a top-shelf dual-differential Cirrus CS4398 DAC and a Sanyo drive with Toshiba servo. The back panel shows balanced and single-ended analog outputs; optical, coax and USB digital inputs and coax/optical outputs. The beveled glass lid captured in a rail triggers TOC read-in once closed and stops above a dust guard. It comes straight from the Aura Note Premier. The Groove retains its own USB and separate iPod control ports but loses the tuner section of the Aura Note. There are variable and fixed outputs, three RCA and one XLR input. Output power from the Hitachi J162/K1058 Mosfets in parallel push/pull scales up to 75wpc into 8 ohms, volume control in 99 steps is by Cirrus Logic CS3310. The headphone socket moved to the front and the volume encoder knob now has an analog rotary feel with mini click stops. As on the Neo, the controls set into the blacked-out recess of the chromed panel are black to not telegraph fingerprints as did the Aura Note and Premier. PC and iPod interactivity create a stylishly modern complete 2-box system—just add speakers—that will be right at home on the desk top or in a TV or hifi context. These components wouldn't look out of place in a Bang & Olufsen store. The catch-all term lifestyle applies without doubt. Yet April Music's genetics as a performance-driven company with a high-value track record suggested that these were more than just pretty faces and shiny city slickers. The Groove contains Apple recognition software to transfer file meta data from an iPod to its own display. Then the Groove's nine iPod-specific controls on the remote (menu, enter, repeat, random, up/down, left/right and play/pause) also do the finger walking. This simultaneously defeats all the iPod's own controls including volume. The iPod's display simply shows the orange sun with the super-imposed Apple logo for signal lock, below it artist and track name in an endless exchange. The Groove's display meanwhile turns into a ticker tape which displays the iPod's usual data. All the iPod's functionality is retained from the Aura remote and only scrolling one item at a time—the Groove's display is limited to one line—through lengthy lists is rather less convenient than the iPod's snazzy scroll wheel. Enabling this interface relies on the included 30-pin-to-twin-RCA+USB-charger cable. As I found out the hard way, this does not work with Apple's own iDock. 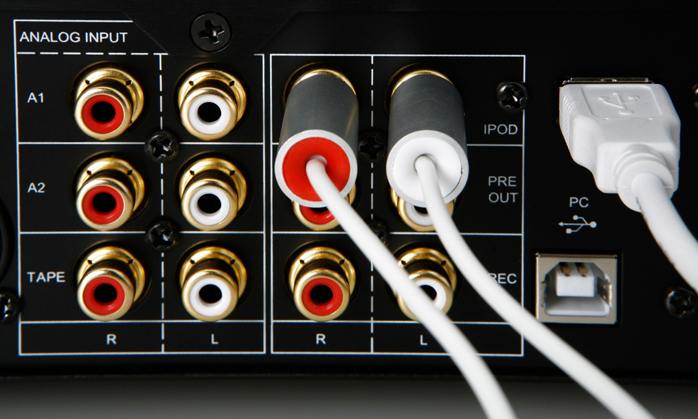 If you want to use that, you will only get iPod sound if the RCA connectors of April's cable tap into a standard line-level input (the USB charger lead of course remains in its socket and charges even when the Groove is in standby). For an instant handshake between iPod and the Groove's dedicated iPod input, you need to either connect the cable's 30-pin connector directly to the iPod; or use Aura's own iDock if you want the iPod to stand up. The Groove's own infra-red eye now becomes the access point from which you control your iPod. It's a very slick bit of integration any iPodder will quickly latch on to. Headfi fanciers familiar with the Aura Note CD/receiver will quickly discover that the Groove's full-size socket is quite superior. It's a really serious high-fidelity port now. It should have all but extremists stick with it rather than go offboard into a dedicated headphone amp via the fixed (rec) output. 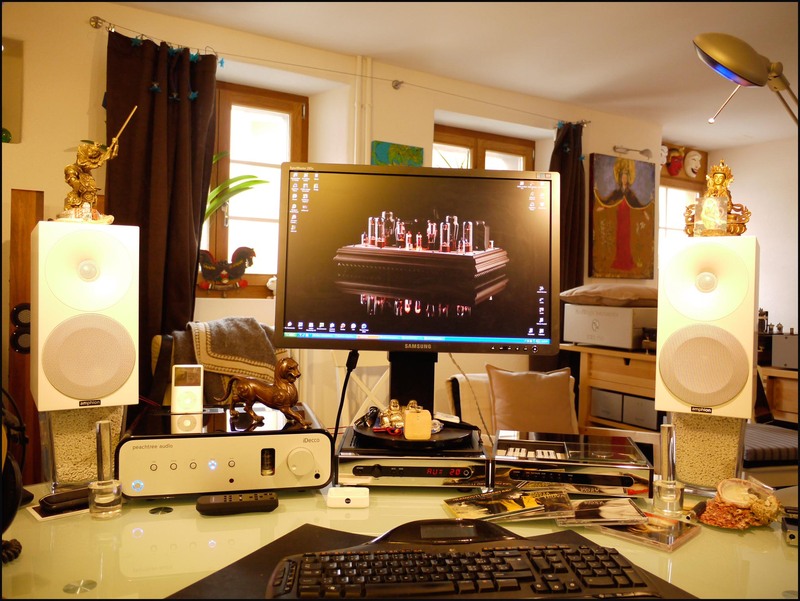 I had Burson's HA-160, KingRex's HeadQuarters and Meier Audio's Corda Symphony can amps on hand to get detailed; and audio-technica W5000, AKG K-702, Grado PS-1000 and Sennheiser HD800 headphones to sample those details. Incidentally, the Groove's compact footprint made an ideal stand for my Samsung SyncMaster 245B computer monitor. I simply floated its base above the perforated Groove top with spacers to not obstruct air flow; not that the Groove's class A/B circuit got very warm to begin with. For PC/iPod users, the Aura Groove with speakers or headphones is all they need for a complete high-performance system. 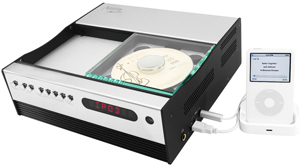 For competition, Peachtree Audio's iDecco is more sophisticated in its accessing of the iPod's digital data and processing them via its internal Sabre reclocker/decoder. The Groove relies on the iPod's own D/A converter (Wolfson or Apple-branded Cirrus). The Aura meanwhile retaliates with a superior amplifier and headphone output and more connectivity. Conceptually, the iDecco will appeal to the 'source first' disciples of Linn's Igor Tiefenbrun. The Groove shifts primacy to the amp/speaker interface. The Aura wins on its display and the robustness of long-term case wear (the iDecco's piano gloss is more accident-prone). The Peachtree adds iPod video functionality. Different strokes for different folks. And two tough decisions between two very compelling solutions.